The fact that technologies are advancing at a dizzying rate is so obvious as to be unremarkable. But the newest technological advances are also having an underappreciated impact on one of humanity’s oldest practices: conflict. Emerging technologies are making the world more complex, interconnected, and dangerous—while undermining the tools, institutions, and assumptions that have buttressed thousands of years of strategic thinking about human conflict. Predicting how this radically new geopolitical environment might play out requires understanding the shifting dynamics of modern conflict. 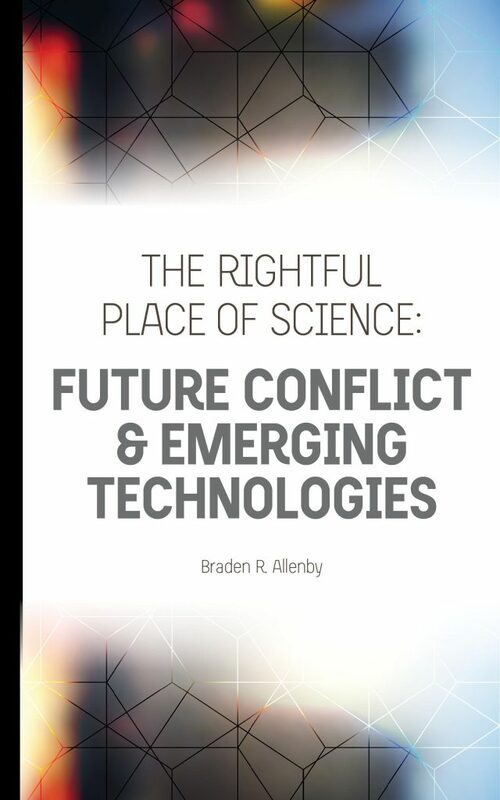 Braden R. Allenby’s newest book, The Rightful Place of Science: Future Conflict & Emerging Technologies, provides the necessary guide through this complex landscape. A leading analyst of emerging technologies in terms of both their military application and their ethical implications, Allenby explores how these new technologies are transforming military and security strategy, making familiar institutions and traditional approaches obsolete. From Russia’s recent invasion of Ukraine to the “durable disorder” of the new Middle East, from the digital frontier of cyber conflict to the use of autonomous lethal military robots, Future Conflict & Emerging Technologies offers a concise and readable introduction to the trends shaping our geopolitical present and future. Buy your copy of this essential book from Amazon.com today.